Installing the Samsung SF-565P was a fast and painless process. The unit ships with three pieces that need to be added to the main unit. The toner unit, handset and cradle, and the plastic document output tray. Of these three, only the toner unit is essential to operating the printer. After removing the toner unit from its plastic wrappings, installing it into the SF-565P took literally five seconds. The front hatch is opened, the unit slid into place and the hatch closed again. Very simple. 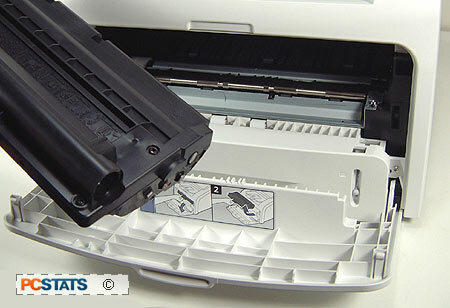 The phone handset and cradle clip to the side of the printer, and the plastic document tray attaches quickly to the front. Software driver installation proved equally simple. The CD offers a choice of custom or typical installation procedures when inserted, and you are prompted to turn on the printer at the appropriate time. The included set of drill-down configuration menus is large and comprehensive, but we wished for a larger display and a less cumbersome menu interface. The SF-565P features 'toner save' and 'toll save' modes, each of which can be activated from an individual button on the control panel. The toner save mode reduces toner usage on printed documents, Samsung claims an up to 40% reduction in toner use in this mode. There is little visual difference in text and line image printouts using the toner saving mode, so whether or not it actually offers the savings that samsung claims, there is not really a reason not to use this mode for regular office work. The toll saving mode stores outgoing faxes until a preset time, then sends them in sequence. This can be useful in countries with metered local calling or when sending long-distance faxes. Using the Samsung SF-565P as a photocopier is easy and intuitive thanks mainly to the descriptive front panel buttons. The photocopier-style start and stop buttons are a good start, and most of the other basic features necessary for copying including dark/light and number of copies are also present as individual control buttons. Since the SF-565P uses a 200dpi optical scanning engine, results are very much on par with low-end photocopiers. Normal sized text is reproduced flawlessly, and our copies remained legible down to 6pt. 4pt text was mostly legible, but ran together slightly. Setting the printer to 'ultra-fine' mode reduced this effect somewhat. The SF-565P is more than suitable for reproducing almost all text documents. Pictures fared less well though; Our initial attempt to reproduce a picture with default settings resulted in an indistinct, overly dark mess. Reducing darkness and setting the copier to 'photo' mode gave much better results, though small (about 4pt) text within the images was not really legible. Speed is decent, as the printer warms up while the first scanned page is moving through the scanner. For example, the first reproduction hit the out tray about 25 seconds after we hit the start button. successive pages print at the maximum speed of the printer (about 16ppm). Again, since the SF-565P uses a 200dpi monochrome optical engine, it's document scanning abilities are somewhat limited. What it does very well is to reproduce text documents and simple graphics. It fares much worse with photos and complicated graphics due to the limitations of the optics. While it can create up to 1200dpi scans, these are simply interpolated from the original 200dpi, so no additional detail is added. The SF-565P is not really intended or advertised to be a replacement for a decent high-resolution flat bed scanner though, so this is a non-issue. Where extra interpolated resolution does come in handy though, is when scanning documents for OCR (Optical Character Recognition). Scanning speed is extremely fast, less than 20 seconds to scan a single sheet of letter sized paper. As it would with a fax machine, the document feeder will continue feeding pages through the scanner until it is empty. This is helpful for scanning several documents at once, though the feeder had an annoying tendency to grab more than one sheet at a time. The SF-565P's faxing capabilities were excellent, which you would expect considering that the printer puts its fax controls front and centre. Anyone who has used an office fax machine before will feel instantly comfortable with this MFP. The 33.6Kbps modem in the SF-565P is used as a selling point and it does boost fax transfer speeds but only when connected to a machine with equivalent speed.